Before Una Mas, I was a 280 pound white guy. In February of 1997 my girlfriend and I went on a weekend trip to the seaside town of Capitola. Since 1991 Una Mas, a local Mexican food chain, had been one of my favorite places to eat. It's healthy food at a fair price and it's comfortable in that "nicer than Taco Bell not as fancy as El Torito" way. Now, I'd been to the Una Mas nearest my house but as a laugh I suggested that my girlfriend and I eat at this Una Mas in a different city. In reality Capitola is only an hour from my house, but a mountain range in between my house and there makes a distant Una Mas seem exotic. As we sat there eating, my mind wandered, as it often does, to sunshine, sheep, little candies with that stuff like cellophane that are so hard to unwrap because they're sticky. Actually, my mind wandered to an unusual thought: "I should visit all the Una Mas locations." To my utter amazement, I'd said it out loud. Five years later, that girlfriend is my wife (my mind had wandered and I'd accidentally said out loud, "we should get married") and I have gone to all 31 Bay Area Una Mas locations. What you are about to read is the culmination of my work and in many states, grounds for institutionalization. Any resemblance to Obsessive-Compulsive Disorder is completely coincidental. I'm a simple guy who likes what he likes and isn't really big on change. I don't get tired of having the same thing for lunch everyday if it's something I like. Now when I say that I eat at Una Mas a lot, it's something of an understatement. These days I probably eat at Una Mas three times a week on average. That's relatively low considering that when I used to have a job across the street from one, I ate there 28 days out of a 31 day month. Those other three days I was standing outside the Una Mas headquarters begging them to let me live there. For those of you wondering what the heck an Una Mas is, I'm here to help. Una Mas is a small chain of Mexican food restaurants in the San Francisco Bay Area. They have 31 locations in such popular cities as San Jose, San Francisco, Milpitas, Sacramento and Fremont. When I first discovered the place in 1991, I used to order steak quesadillas, which are a genuine slice of Mexican heaven. However, pounding down two of those bad boys each trip quickly led to extra weight. For the next few years I'd order two chicken burritos on wheat tortilla with no beans and extra salsa. A few years ago they stopped carrying the wheat tortilla, and asking for extra salsa could sometimes cause confusion, so to this day a slimmer me orders two chicken burritos with no beans. In order to actually cross an Una Mas off the list, I had to go there and eat a chicken burrito. It wouldn't count if someone brought me food form the one in Los Altos. Visiting 2 or 3 Una Mases on a single day sure would have made the tour a lot easier, but as a challenge, I didn't let myself visit more than one per day. Next, I was never allowed to travel to an out of the way Una Mas with the express purpose of going to that Una Mas. This rule made the tour take a while, as up until a year ago, I never had reason to drive three hours to Sacramento. Worse, Sacramento has three locations, which means I needed three separate trips in order to hit them all. Three hours, three locations, three trips. The quest took on mystical dimensions and it's all Sacramento's fault. The Una Mas Corporation also owns a smaller chain of restaurants called Pollo Rey. They look identical in both menu and theme, but as a purist, I did not count them as actual Una Mas locations. I'm pretty sure there is only one of those I haven't been to anyway. When I'd tell people that it is my goal in life to visit all the Una Mas locations I would usually get one of two responses. The first response is a look as if I'd just said, "I lost my testicles in Vietnam." It's a look of confusion (as I'm not old enough to have gone to Vietnam) soaked in an ancho sauce-like pity (because clearly my life is over). The second response is that they tell me some other place that has really good Mexican food. No, really, thank you, I've tried Baja Fresh. And it's no Una Mas. The best response I ever got was from a guy I used to work with. After only having known him a few days I confessed my goal of visiting all the Una Mas locations and he responded by telling me that it was his goal to run around the capitol building in every state capitol in the U.S. He was up to seven last time I checked, the freak. 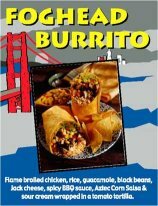 Ironically, you cannot get this burrito in San Francisco. In order to make sure that I visited every Una Mas location there was, I did some research. I used the back of a "to go" menu, which listed most of their locations and the Una Mas website. As their menu has changed over the years, new locations have popped up, which I added to my list. So one day I get in the car and drive to San Francisco to run some errands. I figure it's the perfect time to visit the Una Mas in San Francisco on Folsom Street. When I get there, no Una Mas. I walk around the area, no Una Mas. There isn't even a hint that there used to be an Una Mas there. Where did it go? Why does the Una Mas website say there is an Una Mas there? Is it like the castle in Krull that constantly moves around or like Brigadoon, which only shows up once every hundred years? Disappointed but still craving a burrito, I ate at the nearest place advertising Mexican food I could find. I can whole heartedly tell you that there is no reason you ever need to eat at the Garage Café, Liquor, Wine, Beer and Deli. This Una Mas saw me 28 out of every 31 days. Every day I would call in my order then walk across the street from work to pick it up. After a few weeks, the employees started calling me by name. A few weeks after that, they knew my name and my order. It eventually got so that I would call up and say, "I'd like to place an order to go." They would respond, "is this Michael?" That's service. What makes them even better is that the night shift kinda knows me too or at least recognizes me as that guy that likes chicken burritos with no beans. Going to that Una Mas for me is like going to Cheers where everybody knows your name. Runner up - Sunnyvale, El Camino & HWY 85, though you need a token to use the bathroom. A franchise of restaurants is built on the idea that no matter which location you visit, you're basically getting the same quality and ingredients that you'd get at any other location. Can someone tell me then why this Una Mas doesn't have jack cheese? If you order a quesadilla at any other Una Mas, it's going to have jack cheese inside. At this Una Mas, every menu item that would normally have jack cheese on it will instead have cheddar cheese. Worse, the mildest cheddar cheese to be found in three counties. I thought it was a mistake the first time I ate there, but it's not. They have simply chosen for whatever reason to not use jack cheese. If you ever go to this Una Mas, I recommend eating at the Chinese place next door, where they do not serve cheddar cheese on your orange chicken. Best Decoration - Sacramento, Fair Oaks Blvd. Most of the Una Mases have the same decorations and pictures on the wall but every once in a while one breaks out of the mold and goes "decoration crazy." The Una Mas on Fair Oaks has a VW bus cut in half and mounted on the wall. The entire time I sat there eating I wondered if the driver's door would open and if I could get inside. Runner up for this award is the "salsa cage" at the Una Mas in Daly City. It's not really a cage, but it's the only Una Mas where the salsa bar is encased in glass in the middle of the restaurant. The entire time I sat there eating, I wondered how cool it would be to fill it with monkeys. About 4 months ago I walked into an Una Mas and there was a sign advertising "All You Can Eat." Surely I thought I'd died and gone to heaven but it was true. Some participating Una Mases have an "all you can eat" special on weekends and weekdays after 5pm. While not a traditional all you can eat, it is certainly more food than I can eat for a mere $6.99. Pound for pound for pound for pound, you can't find a better deal on burritos. Runner up was the "buy a puck, save a buck" promotion they had about 3 years ago. If you bought a little San Jose Sharks key chain for a few dollars you got one dollar off your order each time you ate at Una Mas. The offer was only good for a few months, but saving a dollar per visit does add up. For me, anyway. I know where each and every Una Mas location is so it's only natural that I know where there needs to be an Una Mas. I grew up in East San Jose near McKee Road. I can tell you that there is a severe lack of restaurants on that side of town for reasons I don't understand to this day. Also, you can leave the Una Mas in Fremont and drive south along 680 for half an hour before you get to the next Una Mas. World dominating franchises like McDonalds and Starbucks were not built on having locations half an hour apart. Biggest Disappointment - Stop Stalking Us! Remember when I told you that I once ate at Una Mas 28 days out of a 31-day month? I know that because I got the idea a few years back to let the Una Mas headquarters know that, as Kathy Bates said in Misery, "I'm your biggest fan." I saved up all my receipts and composed a lovely letter to them and sent it off. It's been well over two years and I've never heard a thing from them. Maybe it was my suggestion to rename a burrito after me. Perhaps they didn't like my idea of having a "Senor Goodson" appreciation day. I really wasn't pimping for free stuff, but I did expect a letter of acknowledgement. For the last week or so, I've been trying to contact the folks at the Una Mas main office to tell them about my adventures, but my calls go unanswered. I thought it would be fun to get a tour of the Una Mas headquarters and maybe pander for a job as Regional Manager of Burrito Quality. But until the happy day they acknowledge me, Una Mas will remain the unofficial food supplier of Fanboy Planet. Derek would like to add that Una Mas has great fish tacos, nachos, and taquitos as well, because there's more to life than burritos. Cheddar cheese? Come ON.